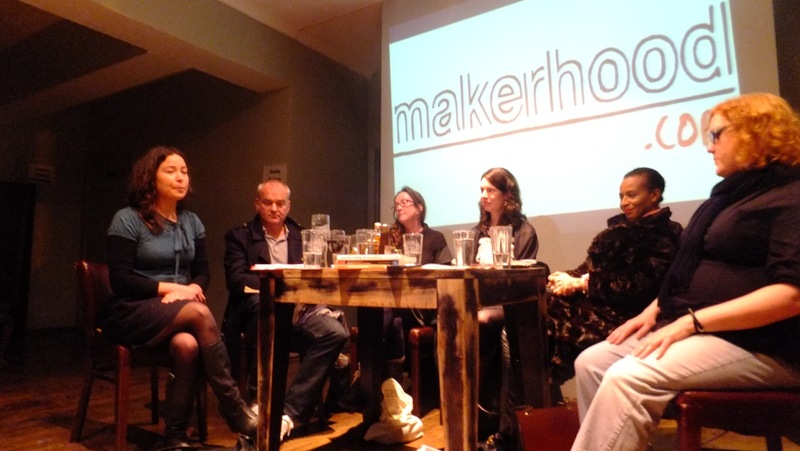 We had an excellent turnout on Tuesday evening for our first local makers’ forum at the Living Bar. Our expert panel – Alison Branagan, Mo Bacchus, Sinead Koehler, Anne Fairbrother and Tim Sutton – gave excellent advice on setting up and running your own creative business, covering everything from pricing and legal requirements to applying for craft fairs and dealing with rejection. Afterwards, everyone had the chance to network, meet other makers and share ideas. Living Bar laid on some excellent food, and Love Cakes London kindly provided a very tasty Christmas cake. Also thanks to Lambeth Council for providing the funding for this event. Judging by the feedback we’ve had, people found it very useful, so we’ll look at how we can organise more workshops in the future. In the meantime, don’t forget our Christmas party this Sunday. Even if you’ve already got your own Christmas cards, you can make some for charity, join in some games, listen to some great music, or just have a drink and chat. We hope to see you there!